“The best course is not the one created by human beings, but the natural land gifted by god, and what we need to do is mark a “tee ground” and “green” on it”. ------ Alister Mackenzie (Designer of Augusta National Golf Club and Pebble Beach Golf Course). Holy Spring Golf Club is a typical example of this. 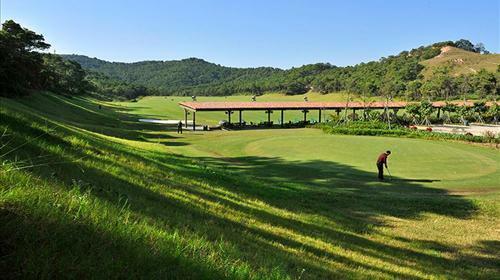 Located in Haitang Bay, It is a 36-hole tournament-level course designed by Nelson & Haworth and opened in September 2011. Built among mountains and rivers, it reserves much of the original landform—the natural hills provide green and fairway for the course while rocks and lakes on naked land serve as traps here, which makes golfing here more challenge. This hill-specialized tournament-level course which is rarely in domestic consisted of two 72-par and 18-hole courses, it covers 2280 mu and matches 7175, 7442 yards. Besides, there is also a golf driving range with 40 seats. The course is embraced by high hills, faced by Wuzhizhou Island and overlooks the beautiful nation’s seashore Haitang By, which form a fantastic landscape—water and mountain stretch tuneful with each other and undulate monumentally with each other. In additional, the different parts of the course are of different width, and the largest differential is nearly 182 yards, making it more challenge and imaginative. Hole No.2: A scenic hole which require skillful tee shot—three bunkers “guarding” in front of the green and bushes surrounding on the highest point behind the green, and any muffed shot would make the whole round irrecoverable. Hole No.3: A very special “signature hole”, where the teen shot need across the canyon before landing on the fairway. Although the ball is already on the fairway, the player still need a strategic way to drive it on an upward terrain. The conservative manner is shotting it segmentally. Normally it is seldom to get the par 4, and 5 is already an excellent score. Hole No.4: There needs a slice on the teen shot and the drop point is on the fairway near the green, the second shot need a club No.1 or No.2 to avoid the bunkers on both sides of green. The slop of this green is sharp so it need careful consideration. Hole No.5: Setting on the extent of the “Demon Turn”, it is the hardest hole of the whole course. However, it’s also a viewing gallery for visitors to take in everything at one glance. Besides, the two Chinese characters “Chan Wu” (get the wisdom in deep meditation) graved in the huge stone there will remind you to ponder the deep meaning of life and golf, which makes everyone stay awhile and think. Hole No.6: After the short relax in the pleasant No. 5, you could get ready to conquer this linear-type par-5 No. 6. Also the second shot needs the club No. 1 to make it as farthest as possible and get rid of the bunkers surrounding before the green, and finally drop stable on the green. Compared to the rugged and challengeable Hole Beef course, the relatively gentle Holy Spring course is more suitable for most golf fans. On the seemingly meandering and boring fairway hiding many bunkers indeed, which means different position of ball cup would lead to different difficulties. Hole No. 8: A par-5 dogleg which requires some skill. A long tee shot could across the bunker on the left side of fairway while most players choose to shot towards the right side of bunker. The second shot must be conducted by wood club to the right to bypass the bunkers on the left. Since the green is higher than fairway, players need to make correct decision on club choose. Along the C8 fairway there also growing arecas. Hole No.18: The last hole on holy spring course, and on the halfpace you can view the splendid holy spring club and as well as it’s surroundings. There you need take 3-shot segmented strategy—in first locate the ball in the right position of the fairway and second bypass the water bunkers which make it challengeable. But don’t worry, just focus on to avoid the bunkers and the get the par soundly!